Powered by Microsoft Windows Storage Server 2012, WCA 4420C storage appliance provide low cost, multi-protocol IP connectivity for concurrent NAS (SMB and NFS) and iSCSI SANs. It is a standalone network storage solution with dual storage controller head (SCH) cluster-in-a-box and built-in all flash SSD disks with 19.2TB raw storage & external SAS ports for DAE JBOD expansion. It gives you automated, application-ready storage that provides high-performance for highly virtualized workload requirements of small-mid size enterprises. Powered by Microsoft Windows Storage Server 2012, WCA 4420B storage appliance provide low cost, multi-protocol IP connectivity for concurrent NAS (SMB and NFS) and iSCSI SANs. It is a standalone network storage solution with dual storage controller head (SCH) cluster-in-a-box and built-in all flash SSD disks with 9.6TB raw storage, external SAS ports for DAE JBOD expansion, and 40GbE NICs for high throughput. It gives you automated, application-ready storage that provides high-performance for highly virtualized workload requirements of small-mid size enterprises. Powered by Microsoft Windows Storage Server 2012, WCA 4420A storage appliance provide low cost, multi-protocol IP connectivity for concurrent NAS (SMB and NFS) and iSCSI SANs. It is a standalone network storage solution with dual storage controller head (SCH) cluster-in-a-box and built-in all flash SSD disks with 9.6TB raw storage & external SAS ports for DAE JBOD expansion. It gives you automated, application-ready storage that provides high-performance for highly virtualized workload requirements of small-mid size enterprises. Powered by Microsoft Windows Storage Server 2012, WCA 4110C storage appliance provide low cost, multi-protocol IP connectivity for concurrent NAS (SMB and NFS) and iSCSI SANs. It is a standalone network storage solution with dual storage controller head (SCH) cluster-in-a-box and built-in all flash SSD disks with 12.8TB raw storage & external SAS ports for DAE JBOD expansion. It gives you automated, application-ready storage that provides high-performance for highly virtualized workload requirements of small-mid size enterprises. Powered by Microsoft Windows Storage Server 2012, WCA 4110B storage appliance provide low cost, multi-protocol IP connectivity for concurrent NAS (SMB and NFS) and iSCSI SANs. It is a standalone network storage solution with dual storage controller head (SCH) cluster-in-a-box and built-in all flash SSD disks with 6.4TB raw storage, external SAS ports for DAE JBOD expansion, and 40GbE NICs for high throughput. It gives you automated, application-ready storage that provides high-performance for highly virtualized workload requirements of small-mid size enterprises. Powered by Microsoft Windows Storage Server 2012, WCA 4110A storage appliance provide low cost, multi-protocol IP connectivity for concurrent NAS (SMB and NFS) and iSCSI SANs. It is a standalone network storage solution with dual storage controller head (SCH) cluster-in-a-box and built-in all flash SSD disks with 6.4TB raw storage & external SAS ports for DAE JBOD expansion. It gives you automated, application-ready storage that provides high-performance for highly virtualized workload requirements of small-mid size enterprises. Powered by Microsoft Windows Storage Server 2012, WCA-3420A Series storage appliance provide low cost, multi-protocol IP connectivity for concurrent NAS (SMB and NFS) and iSCSI SANs. It is a standalone network storage solution with dual storage controller head (SCH) cluster-in-a-box and built-in 4.8TB SSD & 14.4TB 10K SAS HDD disks, external SAS ports for DAE JBOD expansion. It gives you automated, application-ready storage that provides high-performance, high scalability requirements of small-mid size businesses. Powered by Microsoft Windows Storage Server 2012, WCA-3420B Series storage appliance provide low cost, multi-protocol IP connectivity for concurrent NAS (SMB and NFS) and iSCSI SANs. It is a standalone network storage solution with dual storage controller head (SCH) cluster-in-a-box and built-in 4.8TB SSD & 14.4TB 10K SAS HDD disks, external SAS ports for DAE JBOD expansion, and 40GbE NICs for high throughput. It gives you automated, application-ready storage that provides high-performance, high scalability requirements of small-mid size businesses. Powered by Microsoft Windows Storage Server 2012, WCA-3000 Series storage appliance provide low cost, multi-protocol IP connectivity for concurrent NAS (SMB and NFS) and iSCSI SANs. It is a standalone network storage solution with dual storage controller head (SCH) cluster-in-a-box and built-in SSD/HDD disks, external SAS ports for DAE JBOD expansion. It gives you automated, application-ready storage that provides high-performance, high scalability requirements of small-mid size businesses. Powered by Microsoft Windows Storage Server 2012, WCA-3120B Series storage appliance provide low cost, multi-protocol IP connectivity for concurrent NAS (SMB and NFS) and iSCSI SANs. It is a standalone network storage solution with dual storage controller head (SCH) cluster-in-a-box and built-in 2.4TB SSD & 40TB HDD disks, external SAS ports for DAE JBOD expansion, and 40GbE NICs for high throughput. It gives you automated, application-ready storage that provides high-performance, high scalability requirements of small-mid size businesses. 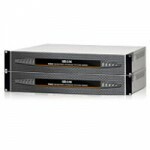 Powered by Microsoft Windows Storage Server 2012, WCA-3110B Series storage appliance provide low cost, multi-protocol IP connectivity for concurrent NAS (SMB and NFS) and iSCSI SANs. It is a standalone network storage solution with dual storage controller head (SCH) cluster-in-a-box and built-in 1.2TB SSD & 40TB HDD disks, external SAS ports for DAE JBOD expansion, and 40GbE NICs for high throughput. It gives you automated, application-ready storage that provides high-performance, high scalability requirements of small-mid size businesses.